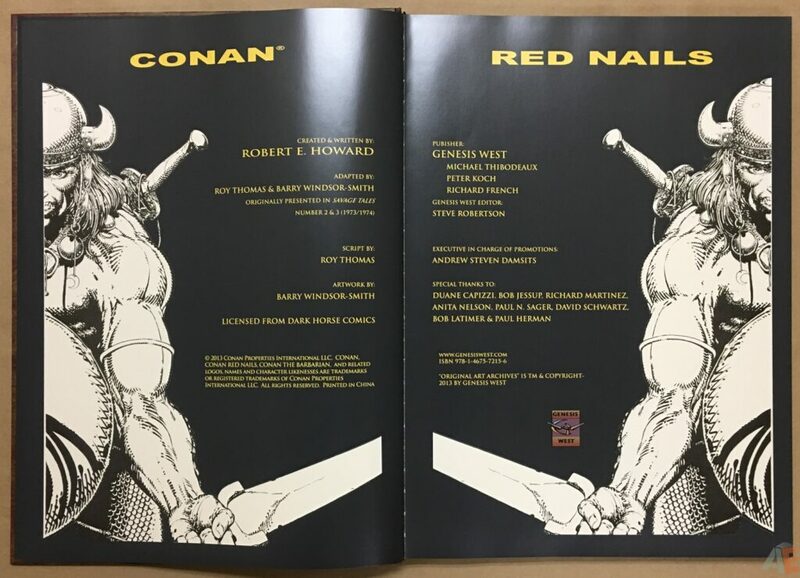 Original Art Archives proudly presents the classic Conan tale RED NAILS as adapted by Roy Thomas and Barry Windsor-Smith 40 years ago. 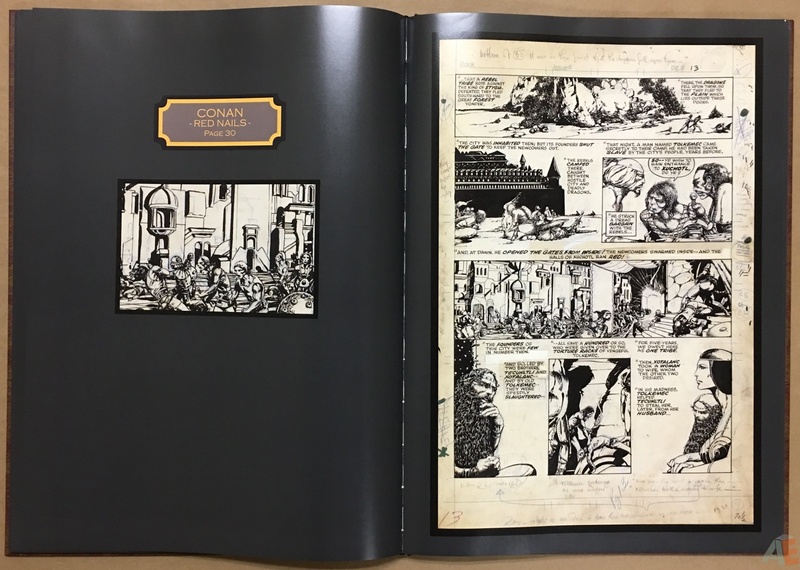 The entire story as well as additional feature materials are presented in a deluxe 136 page slipcased hardcover edition measuring roughly 14×19 inches. 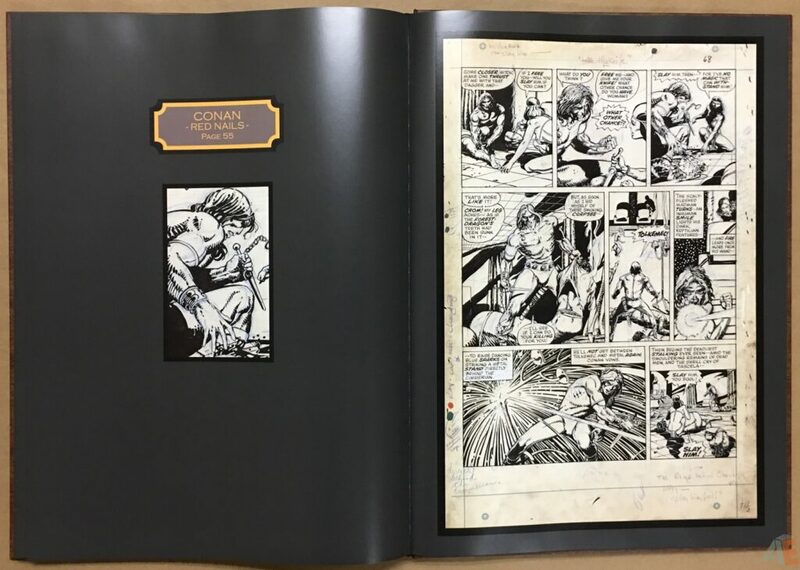 The quality of the reproduction, presented at the actual size of the original art, is truly beyond compare. 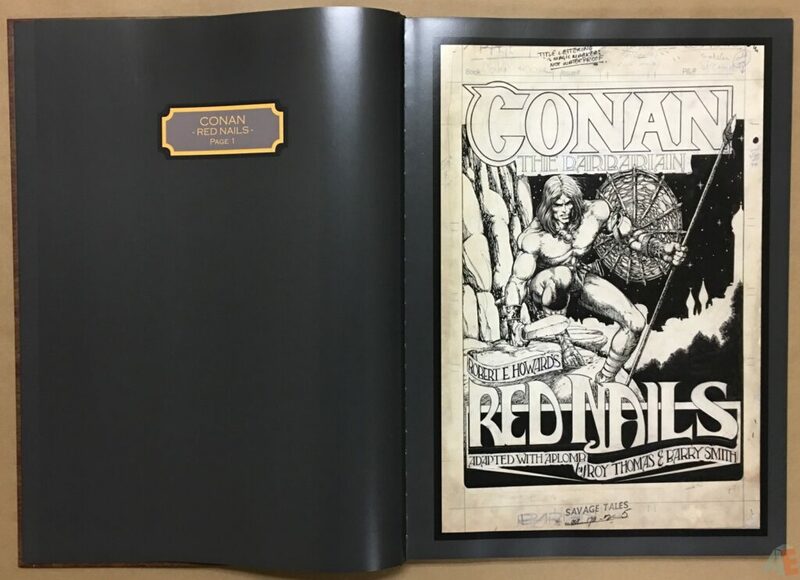 The first and only artist edition style book of Barry Windsor-Smith sumptuous artwork, Conan: Red Nails Original Art Archives Volume 1 presents the full story in a wonderful package. A complete reprint of all fifty-eight pages of Red Nails from Marvel’s Savage Tales issues two and three. 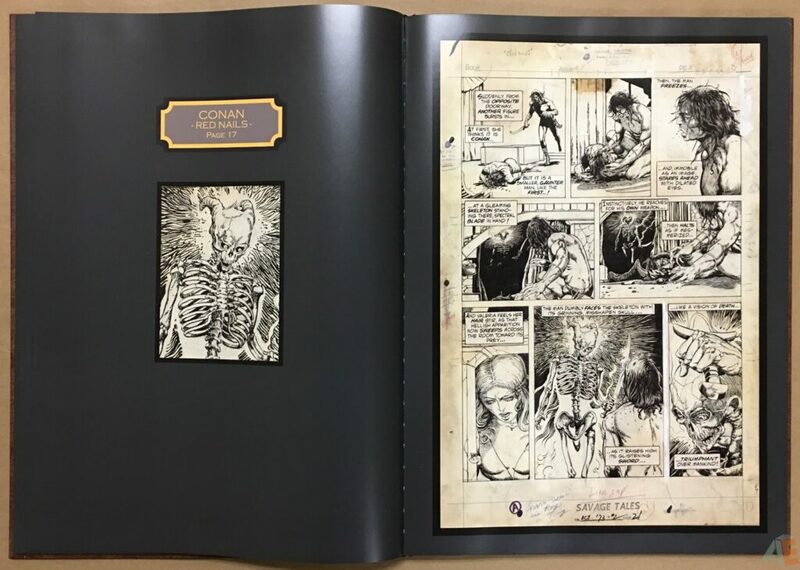 This book is completely unlike any other original scanned art printed at full size type book, for two reasons: glossy paper and art only appearing on the right side of the book. Let’s look at each one. 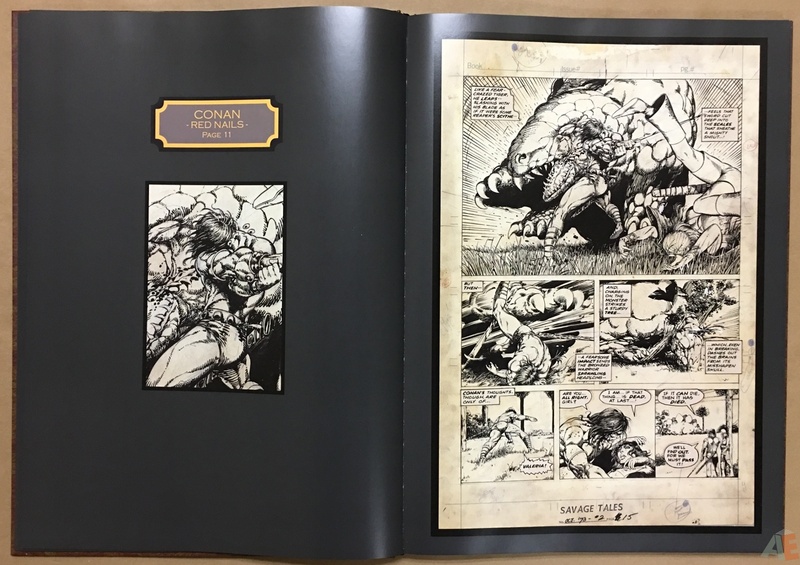 For every company printing these artist’s editions the choice of paper has been a matte stock that is as close as possible to original comic art board, since it’s solicited as being as close to holding the original art in your hands as possible. 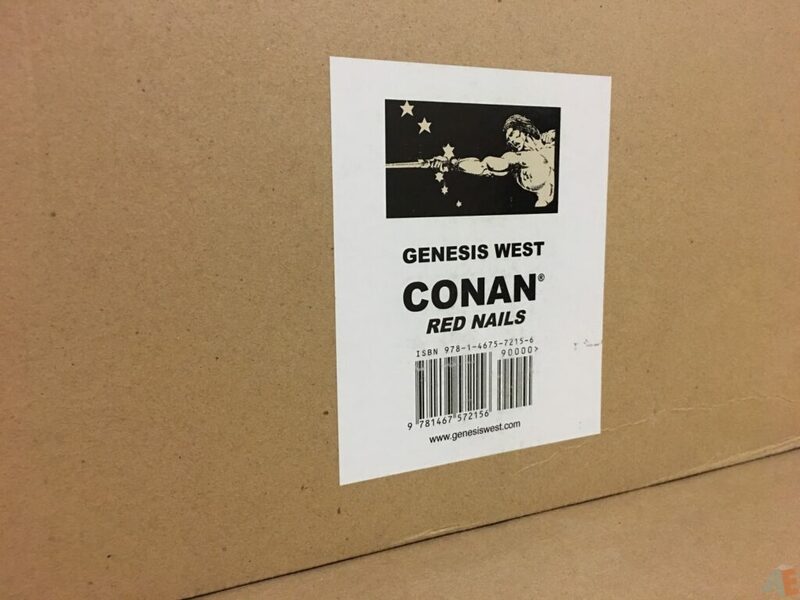 Yet Genesis West went with a glossy paper stock. It’s clean, bright and doesn’t detract from the original material in the least, much to my surprise. The paper is a heavy stock but has a slick feel. Peter Koch, one of the book’s publishers, had this to say. We went back and forth ourselves on the glossy vs. matte selection. 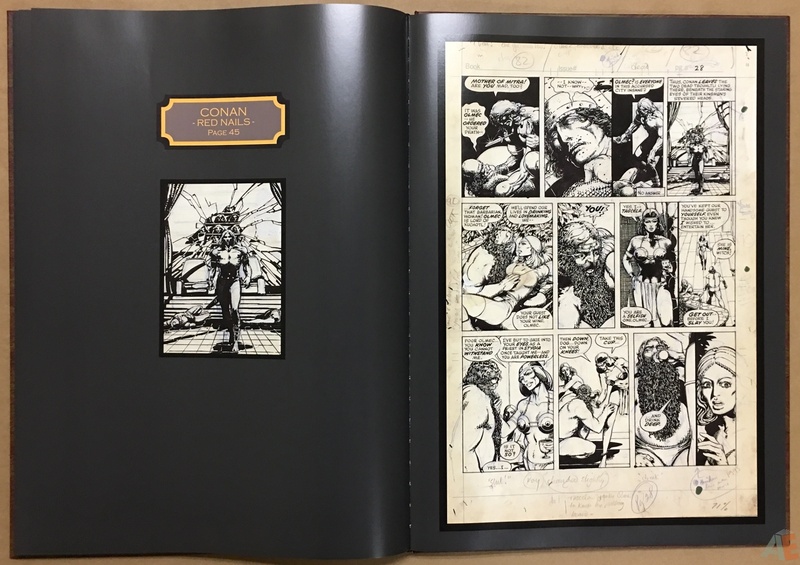 As art collectors ourselves our basic goal is to come up with the product that we ourselves would most want to own and hope that others would see it that way as well. 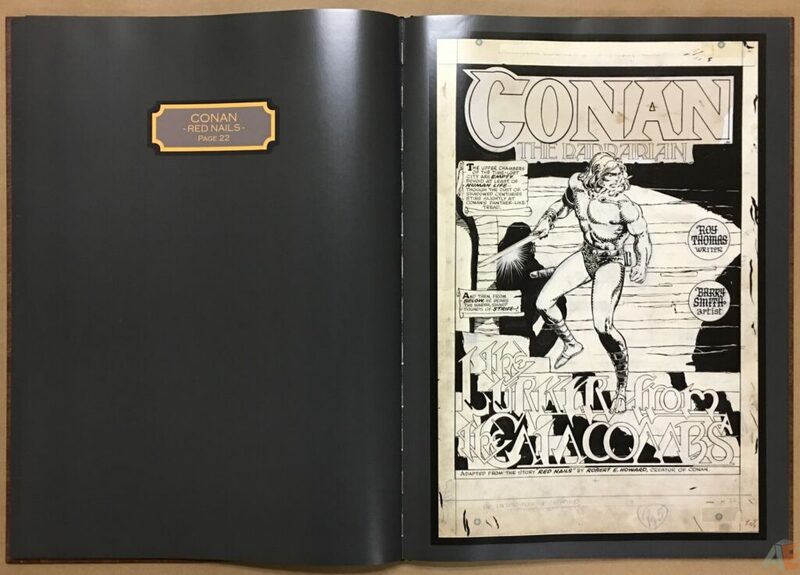 Our goal is indeed to most accurately recreate the experience of VIEWING the actual original art- but this is not entirely compatible with recreating the FEEL of the art boards. 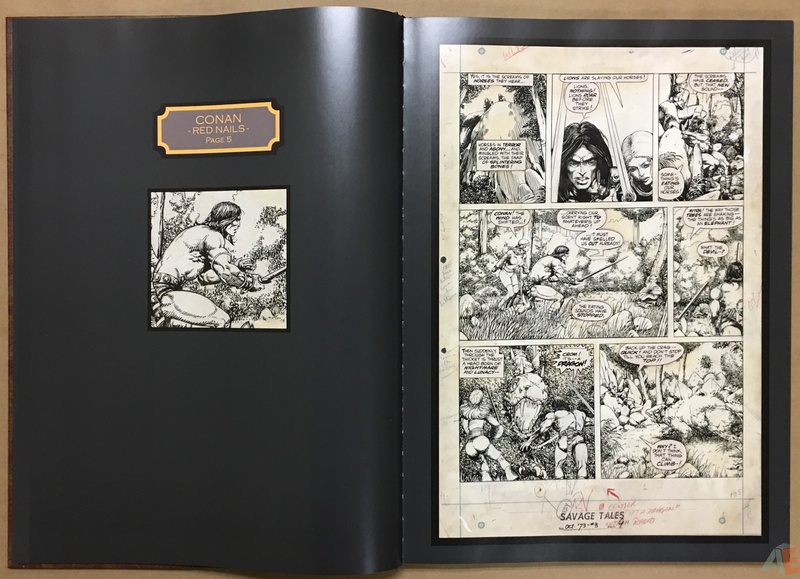 When the printer ( who also prints IDW’s books ) handed us proofs on the regular AE paper and also on the glossy paper it was clear that there was no comparison in terms of capturing the true nature of the art- as opposed to the feel of the paper- between the glossy and matte stocks. 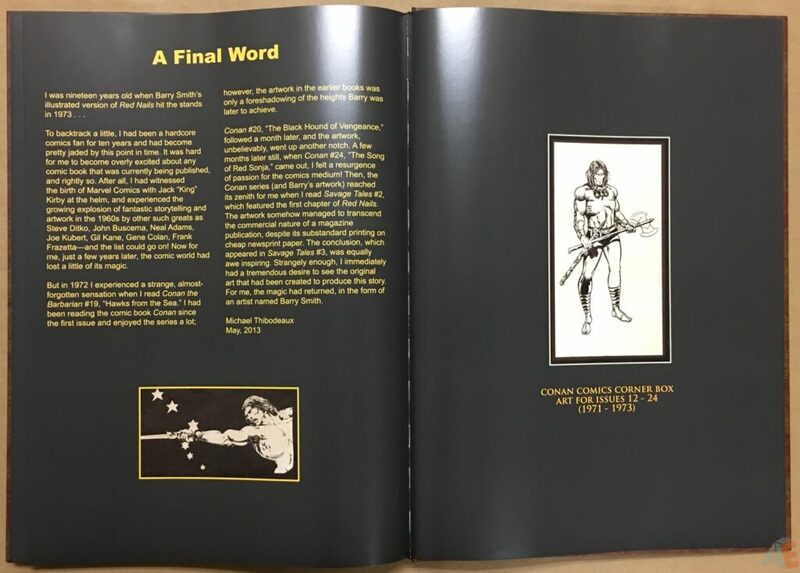 As we compared our glossy proofs to say the TARZAN and ROCKETEER books, again the was really no comparison. 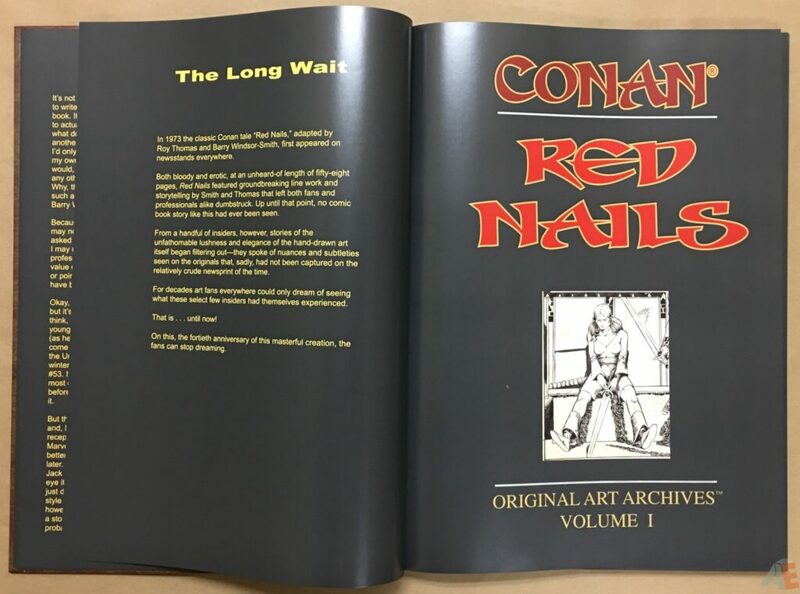 Take a look at RED NAILS for a while, then look at the books I mentioned, and ignoring the feel of the paper, judge for yourself which is really looks like the ART. As I said, in our view it wasn’t even close. 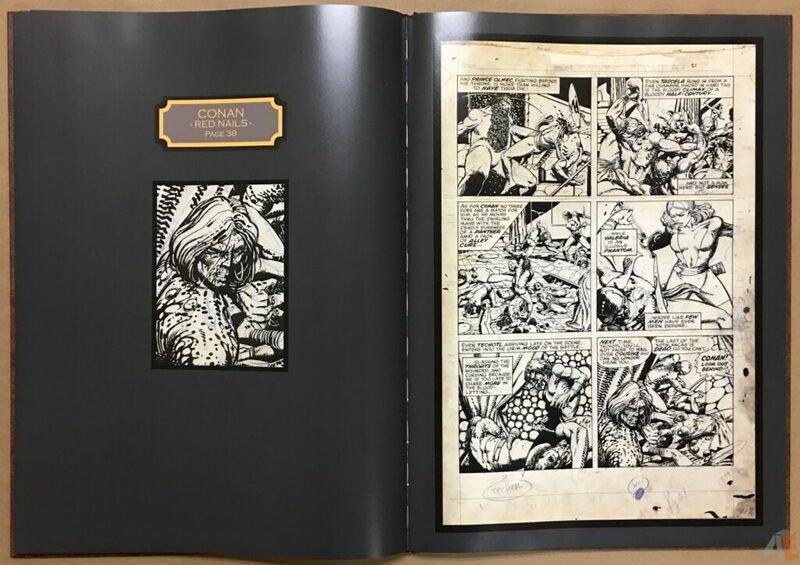 As art fans whose actual goal is to see and recreate the true artistry of guys like BWS, Kubert, Stevens etc. we have to go with what’s more faithful to their work. 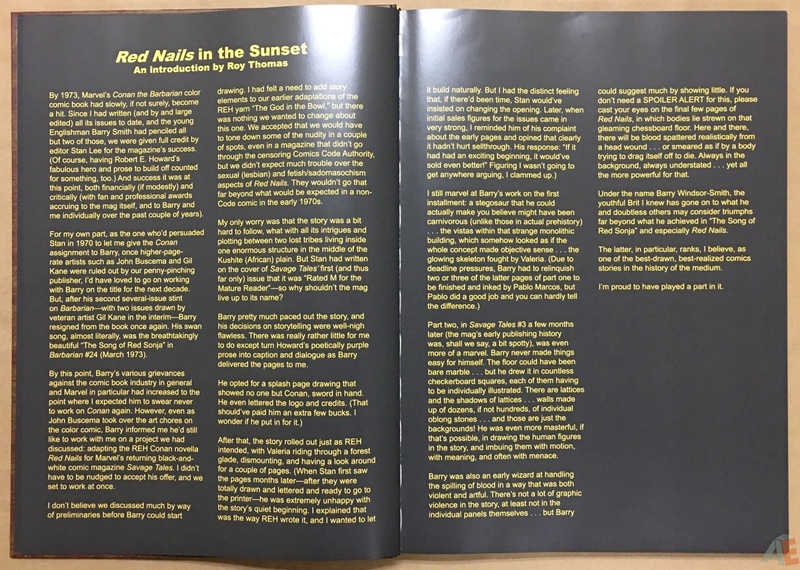 We toyed with the idea of going with a 50/50 print run of glossy and matte but we felt that as people looked at the matte book for a while and compared it to the glossy version, they would ultimately feel bad about having the matte version. 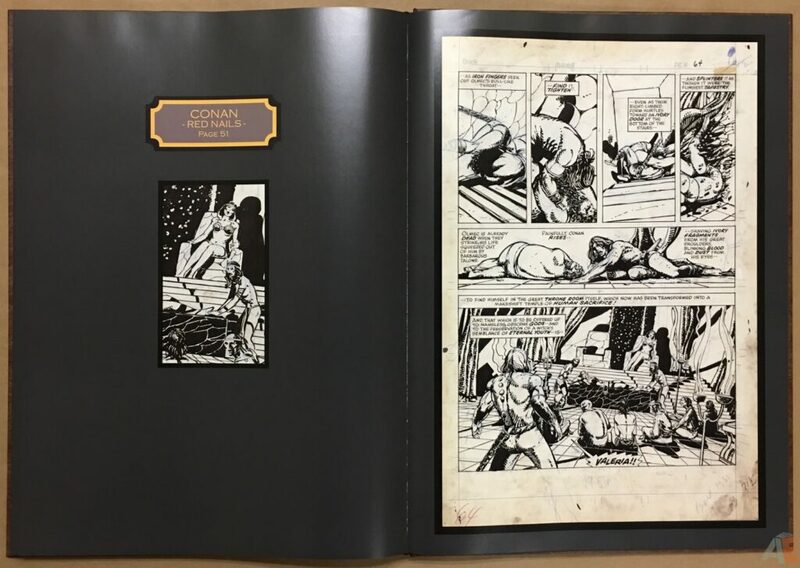 We might give it a shot for the next one, but I can almost guarantee you that once anyone holds the two versions side by side, at the end of the day they would prefer the glossy version ( and like I said, we are using the same printer as for the ARTIST’S EDITIONS ). Take a look below; unfortunately I couldn’t get a picture without glare, which happened while reading as well. Since it’s a large book most of us will be reading it on a table and don’t have the luxury or repositioning it to avoid glare from the glossy pages. 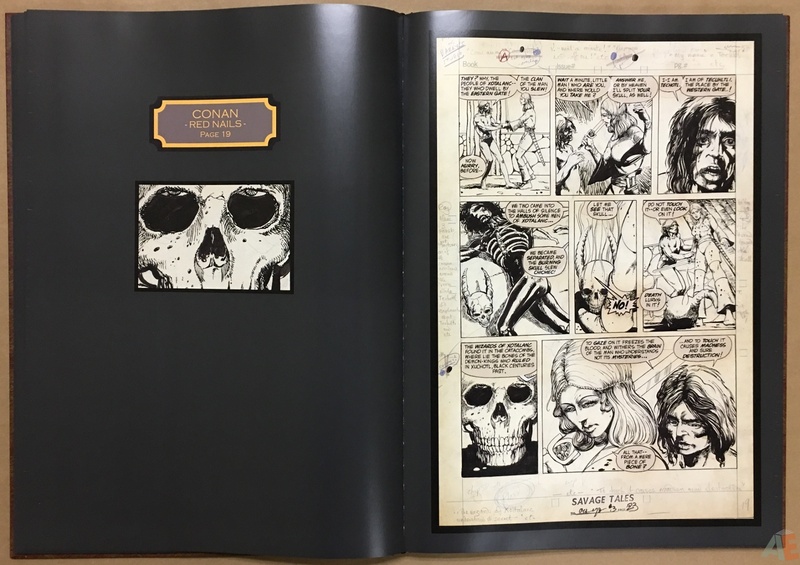 The second point is more poignant: art only appears on the right side of the book, as you can see. 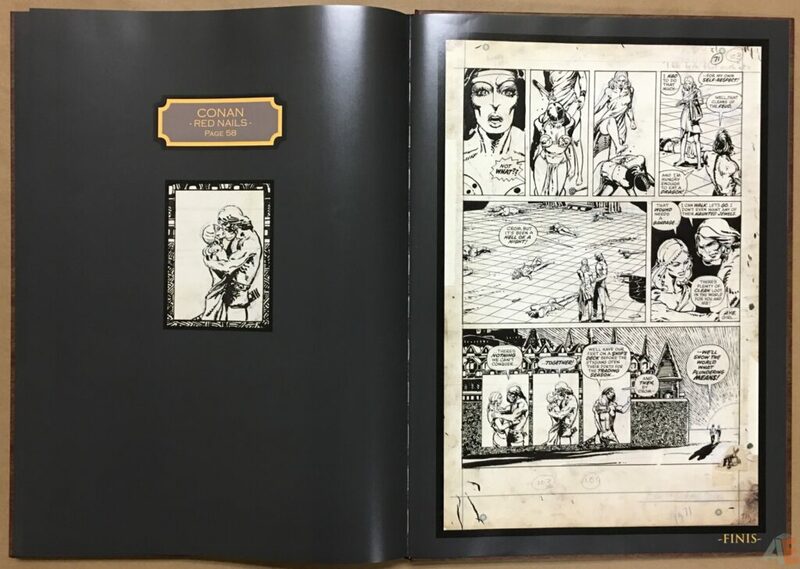 The left side is a close up of a panel from the opposite page. That means while the book is 132 pages you’re only getting 58 pages of original art, 58 pages of wasted space with a panel on it, and the rest text. 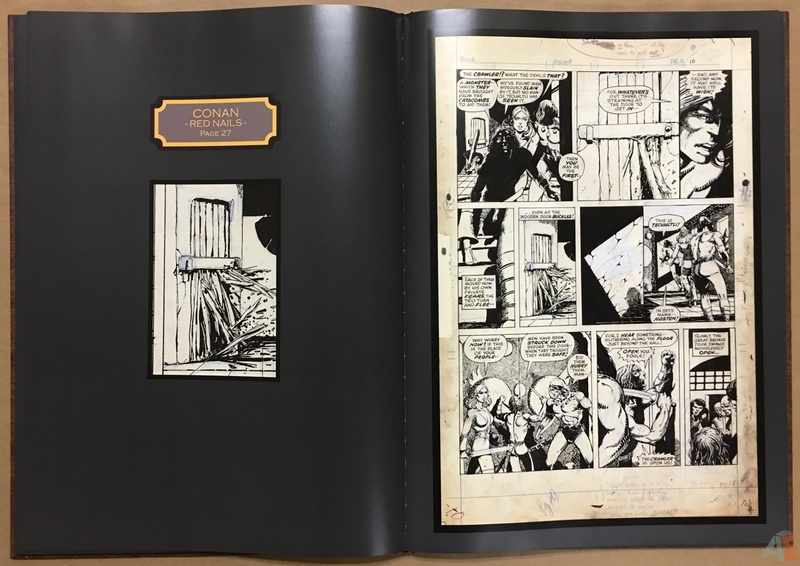 It just feels like there was waste all around: they could have dropped 58 pages and reduced the overall cost of the book, perhaps down to somewhere south of $100. I realize it’s a strong design choice it doesn’t enhance the reading experience, and the enlarged single panels aren’t worth the additional paper and cost. It’s a well produced volume. Binding is stitched and stays flat at almost all pages; very front and back give a little grief. Design is very simple, black endpapers and a very dark grey colour scheme throughout. Love the slipcase: should keep this edition clean and tight for a long time to come. 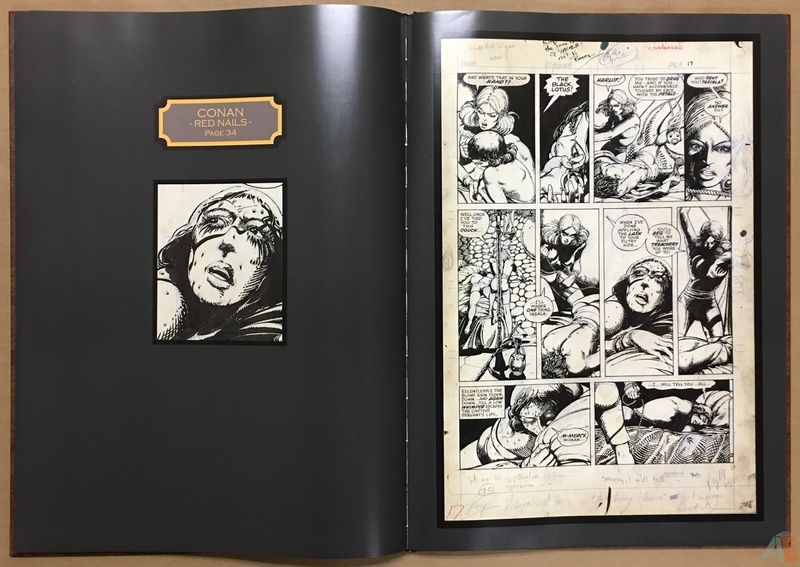 Extras include an introduction by Roy Thomas, an appreciation by George Perez, afterwords by Jose Villarrubia, Andrew Steven and Michael Thibodeaux. 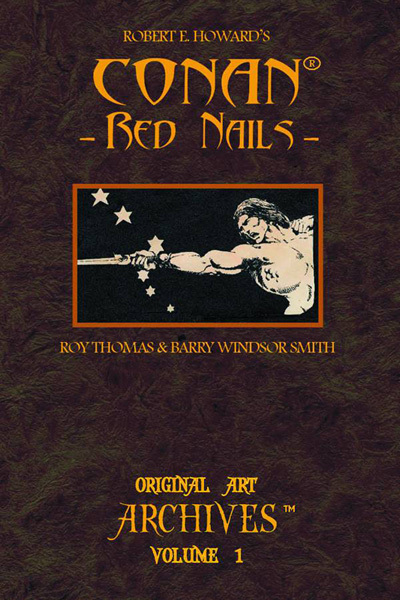 Also the cover box art and short biographies of Robert E. Howard, Roy Thomas and Barry Windsor-Smith. Unfortunately there are no covers included. While it’s available for $150 USD direct from the manufacturer other online retailers were listing it at $200 and I paid $215 CDN at my local comic shop. For Windsor-Smith fans it’s a must have item.